I was teaching yoga to patients in an Eating Disorder Clinic, and in my daily life I was meeting so many women who looked like they had the ‘perfect’ body, but were still deeply unsatisfied with it. Watching them try diet after diet, restricting, over-exercising, counting calories, I became fascinated in the subject as this is how I was for many years, too. A friend told me about the Institute for the Psychology of Eating, and I honestly felt that the Coach Certification Course was written specifically for me. I love holding space for clients to realize that fundamentally there is nothing wrong with them and that their challenges with food and body are pointing to to something deeper. Marc David taught us “the way you do food is the way you do life” and I love connecting the dots with people’s relationship with food and the patterns in their life. I also love supporting women to move past their eating challenges and and to use that energy for something more purposeful. My clients are mostly women and I see clients both in my home office and via skype, which allows me to work with clients globally. I offer 6 or 12 week packages and there is the option to integrate yoga and meditation into the sessions. I specialize in body image and predominantly work with those that restrict, binge, overeat and have fears around food, or are unable to stick to a healthy way of eating and find it overwhelming to find time for self-care and nourishment. I found the case studies that Marc David presented to us during the training to be invaluable in preparing me to work successfully with clients. I continuously refer back to these audios when I work with clients. They were so diverse and interesting, and covered such a broad range of challenges and symptoms. I loved the course content, but I have to say my favorite aspect was the Facebook group. It was like no other online group I have experienced. So much support, insights and helpful information. It became an essential learning tool through the training, especially because there were so many other students with a wealth of knowledge to learn from. The IPE staff running the facebook group also provided the most compassionate and well articulated responses to posts that I was continually in awe. 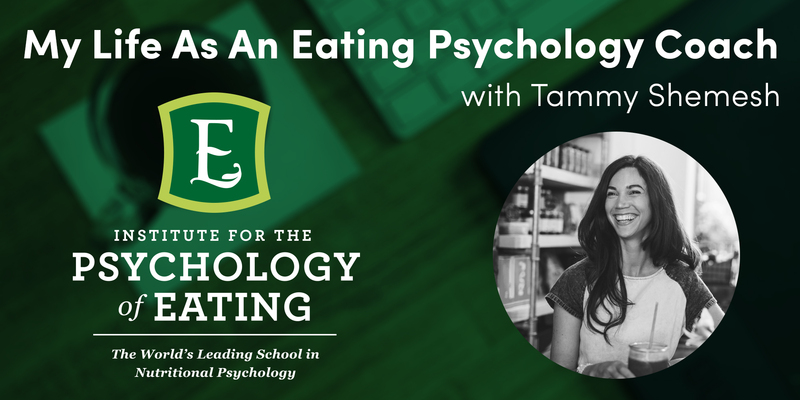 How has being an Eating Psychology Coach impacted your professional and/or personal life? The training certainly did make me question the beliefs and assumptions I have around food and body image and softened my attitude towards my previous relationship with food. I felt like I found my calling. That my purpose is to support other women in finding peace with food and body image. I love working one-on-one with clients as it’s so personal and individual, so my goal is to expand my practice and support as many women as possible in changing their relationship with food through eating psychology and yoga. I hope to create an online component to my packages and run group retreats. I feel so fortunate to have had the opportunity to learn from Marc David. He has such a wealth of information and shares it so passionately. I would highly recommend the training for anyone that is ready to look at food and psychology in a whole new light. BIO: Tammy works with women worldwide, who struggle to accept and love their bodies. Tammy teaches yoga for disordered eating and body love, guiding students to become deeply intimate with what they can feel and all that they are. She supports those who restrict, binge and overeat, or are unable to stick to a healthy way of eating and find it overwhelming to find time for self-care and nourishment. She creates personalized mind body nutrition programs that focus on body acceptance, supporting clients to discover and release what’s getting in the way of taking loving care of themselves. Tammy teaches workshops on mindfulness and healthy eating and also mentors girls suffering with anorexia.